QFly, a system developed by the German Aerospace Center (DLR), is able to assess the mirror fields of solar power plants for their alignment and dimensional accuracy. From left to right: Badr Ikken, Director General IRESEN, Aziz Rebbah, Moroccan Minister for Energy, Mines and Sustainable Development, Thomas Altmann, Vice President Technology, ACCWA Power. Robert Pitz-Paal, Head of the DLR Institute of Solar Research. Award ceremony at SolarPACES 2018 in Casablance (Morocco): From left to right. Marc Röger and Christoph Prahl from the Institute of Solar Research. The award was presented by Alain Ferriere, member of the SolarPACES Executive Committee. QFly, a system developed at the German Aerospace Center (Deutsches Zentrum für Luft- und Raumfahrt; DLR) for airborne quality assessment of solar thermal power plants, has been awarded the SolarPACES Technology Award 2018. 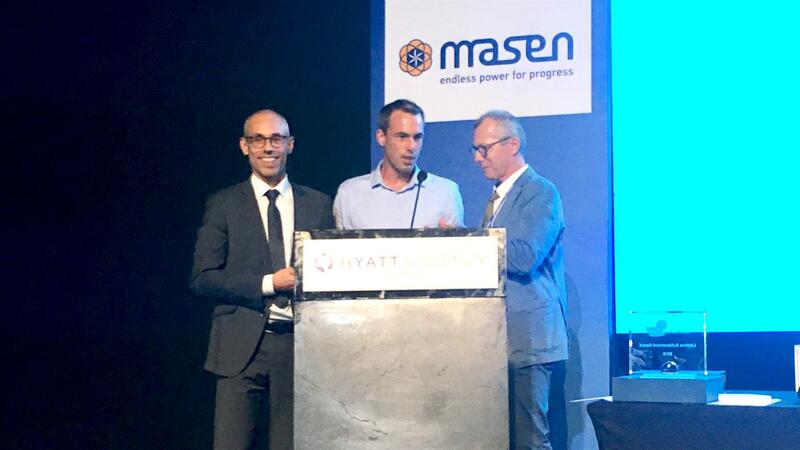 The award was presented during SolarPACES, an annual conference dedicated to fostering exchange between scientists, representatives from the solar thermal power plant industry, interested parties from government and NGOs. SolarPACES 2018 took place in Casablanca, Morocco. The cooperation partner and host within the country was the Moroccan Agency for Sustainable Energy (MASEN). Every year, the SolarPACES Technology Collaboration Programme presents the SolarPACES Technology Award to an outstanding new technology during its annual conference. This year, the team of developers behind DLR's innovative QFly system – Christoph Prahl, Marc Röger and Niels Algner of the DLR Institute of Solar Research, and Steffen Ulmer of the DLR spin-off CSP Services – won the award. 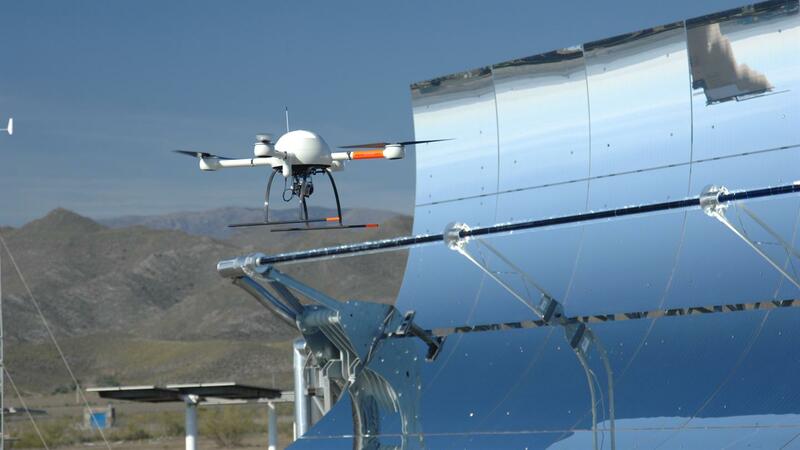 With QFly, the quality assessment of solar-thermal power plants can be conducted using an airborne drone. The analysis software developed by DLR is at the core of the system. Solar thermal power plants are an important component of a sustainable energy mix, as they are able to store solar power thermally and then feed it into the power grid hours or days later. Special mirrors in solar thermal parabolic trough power plants concentrate the solar radiation onto a receiver, where it is converted into heat by an absorber. Heat is carried away from the absorber by a heat transfer fluid. This transfer fluid, which can reach up to 400 degrees Celsius, is used to generate steam in a connected steam-driven power plant, driving a steam turbine to generate electricity. The higher the efficiency of the power plant, the higher its ultimate output. The optical quality of the mirrored surfaces is key to the efficient conversion of solar energy into thermal energy. Knowing which mirrors have flaws is therefore extremely important for power plant operators. Up until recently, however, assessing the optical quality of the mirrors was very time consuming. Checking an entire power plant, comprising tens of thousands of mirrors, presented an almost insurmountable challenge. Thanks to the airborne QFly assessment method, the researchers under project leader Christoph Prahl have now succeeded in significantly simplifying the quality assessment of solar collectors. "Until now, getting a full picture of the quality of a mirror field was not possible. With QFly, power plant operators can collect data themselves and monitor such fields with unprecedented accuracy, and thus harness any potential for improvement," says the engineer. The drone of the QFly system automatically flies over the solar field following a pre-programmed route and takes aerial photographs of the collectors. It therefore takes much less time compared to checks performed from the ground: the drone requires about four hours to fully assess the solar field of a 50 megawatt power plant. The analysis software uses the images to calculate the shape accuracy of the mirrors and determines how precisely they are tracking the position of the sun. The optical performance is visualised in a graphical representation by a colour gradient on the collectors. This enables a trained operator to determine the maintenance requirements of each collector at a glance, and to pinpoint any construction or design errors. The QFly software was developed for operators based at industrial and service companies and can be purchased under license from DLR Technology Marketing. Morocco, the host country of this year's SolarPACES conference, is a pioneer in the field of renewable energy within the MENA (Middle East and North Africa) region. The country is hoping to cover 42 percent of its energy needs with renewable sources by 2020. Ten years later, this share should have risen to 52 percent. In his opening speech, the Moroccan Minister for Energy, Mines and Sustainable Development, Aziz Rabbah, invited the SolarPACES members to engage in more intensive cooperation on research and development with Moroccan partners. Morocco's flagship project is the Noor power plant complex, comprising the Noor 1 - 3 solar thermal power plants and the Noor IV photovoltaic park. The Noor solar plan focuses around the target of generating 2000 megawatts from renewable energy sources by the year 2020. The solar thermal part of the Noor complex is set to contribute 510 megawatts of this total figure. The biggest advantage of solar thermal power plants is their connected storage tanks, which can provide high temperature heat for generating power – event at night or when it is overcast. Morocco is well on its way to achieving its stated goals: Noor 1 was connected to the grid in 2016, followed by Noor 2 in January 2018. Final tests are currently being conducted on the third Concentrated Solar Power (CSP) plant, Noor 3 – Morocco's first solar tower power plant. The Noor IV photovoltaic (PV) facility will also be completed in 2018. At the SolarPACES conference, the President of MASEN, Mustapha Bakkoury, also revealed that a second large solar complex is nearing completion. 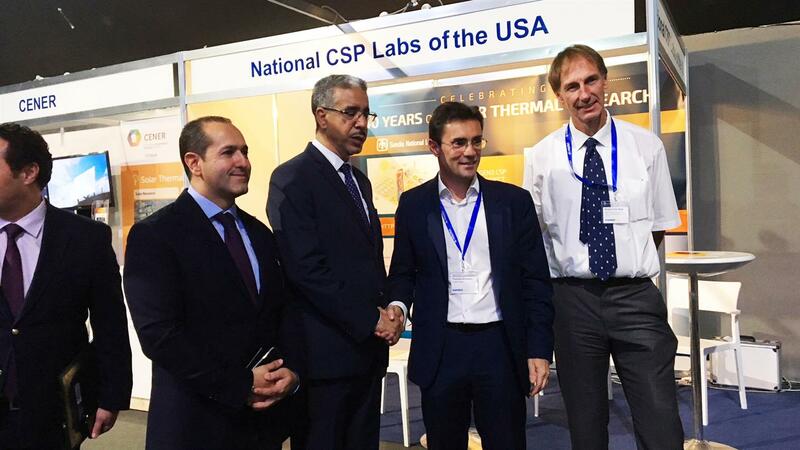 The Noor-Midelt project, which has received 125 million USD of funding from the World Bank, will integrate PV and CSP technologies into two hybrid power plants. By combining the advantages of both technologies, Morocco expects significant cost reductions in solar thermal power. Robert Pitz-Paal, Chairman of the SolarPACES Technology Collaboration Programme and Director of the DLR Institute of Solar Research, believes that SolarPACES 2018 has had a positive impact: "With around 500 attendees and over 500 contributions from research and industry, this year's SolarPACES was once again the biggest and most important international forum for knowledge exchange and networking in the field of concentrated solar power technologies. I was particularly pleased to hear that even independent energy consultants such as Bloomberg consider CSP technology to have huge potential compared to PV battery systems."